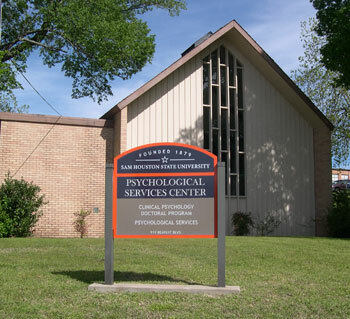 The Psychological Services Center is now located at 919 Bearkat Blvd., formerly occupied by Career Services. With five times more room, the new location has essentially diminished last year's counseling waiting list of four to six months. Sam Houston State University’s Psychological Services Center saves Walker County hundreds of thousands of dollars annually by providing residents with counseling at a discounted rate. Now at a new location that grants them five times more space, the center anticipates being able to help even more people and saving the county even more money every year, according to Psychological Services Center director Mary Alice Conroy. The center now comprises eight offices, a family room, a group area and a classroom that will hold up to 50. “We had a tremendous waiting list (at the previous location),” Conroy said. “Our waiting list for assessment had ranged last year from four to six months, which is really hard for anybody who wanted to get quick services. The center will celebrate this additional room, as well as inform the community of the services offered, during an open house on May 1. The event will be held from 3-6 p.m. in the PSC Building, located at 919 Bearkat Blvd., previously occupied by Career Services. Opened in 1999, the center’s staff, including approximately 12 doctoral students per semester and several licensed psychologists, offers affordable therapy for both adults and children with problems such as anxiety disorders, depression and behavior problems, or who need grief counseling or anger management. In addition, the staff provides assessments for things such as learning or development disorders, as well as forensic assessments for both criminal and civil cases for 14 different counties in Texas. The clientele is largely obtained through word-of-mouth but is also referred by pediatric groups, lawyers, churches, physicians and probation departments. Counseling sessions conducted by doctoral students are always carefully supervised and video recorded for evaluation purposes by psychology faculty members. The videos are erased after the evaluation process, according to Conroy. All sessions are completely confidential and are provided year round. The center is open from 8 a.m. to 5 p.m. Monday through Friday, and sessions after 5 p.m. are available by appointment. Those interested in utilizing the services are encouraged to call the center and speak with a clinic coordinator, who will conduct a telephone interview that takes 15-20 minutes to discuss what problems are being faced and what kinds of services the person is seeking. Income information is also taken to determine the fee, and then the coordinator will call the person back to see if they want to make an appointment, Conroy said. “Right now we can almost make the appointment within a couple of days because now that we have all this space, our waiting list has really gone down,” she said. The word-of-mouth publicity and the quality of students have led the center to develop a good reputation, Conroy said. The center’s internship placement is officially at 80 percent, and the students who work there go on to careers in state hospitals, correctional environments, private practices and in academia, teaching at universities across the country. For more information, or to obtain counseling services, call 936.294.1210 or visit www.shsu.edu/clinpsy.